PHOENIX – With the new year comes new experiences and the opportunity to get a fresh start and enjoy a fun-filled weekend with like-minded women. The Becoming an Outdoors Woman (BOW) deluxe program will be held Jan. 26-28, 2018. Sponsored by the Arizona Wildlife Federation with support from the Arizona Game and Fish Department, the workshop will feature lots of outdoor fun without the inconveniences of camping! Nestled on the banks of the Salt River at the Saguaro Lake Ranch, women will develop outdoors skills while enjoying the beauty that Arizona has to offer. This year, BOW will offer sessions on hunting, fly fishing, kayaking, desert survival, birding, archery and more. 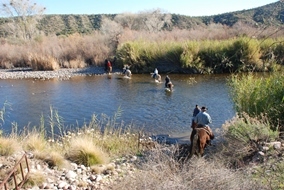 Women also have the opportunity to relax on a trail ride and enjoy views of the picturesque Bulldog Cliffs. Along with outdoors skills development, award winning photographer Lisa Langell will be teaching landscape photography. BOW offers something for every kind of woman and every kind of interest. The $380 registration fee includes instruction, program materials, use of equipment, deluxe lodging, and meals. There will also be evening entertainment and a wine and cheese tasting for women to enjoy. Create new connections, learn, laugh, and enjoy. To get a taste of everything BOW has to offer, check out this video produced by AZGFD in 2016. Details of class descriptions and a registration form can be found at www.azwildlife.org or by calling 480-644-0077.